The Gate Hotel embodies Basras past, present and future through the references integrated into the structures ensemble. The internal spaces come to life as natural daylight permeates the skin with a soft gleam, providing visual texture through the irregular veining. Promoting Iraqs rich variety of natural resources, the industrial steel shell is clad in light translucent alabaster. Often called the city of Shanasheel; the cube s external elevations feature projecting oriel that express the traditional Iraqi vernacular of Basras old city. Emulating the hanging gardens of Babylon; the interior is draped in greenery with flourishing overhanging plants supplying shade and an essence of growth to the thriving microclimate. An awe-inspiring feat of engineering, this striking Gate and Hotel summons an enigmatic atmosphere with its glowing, gravity-defying form. 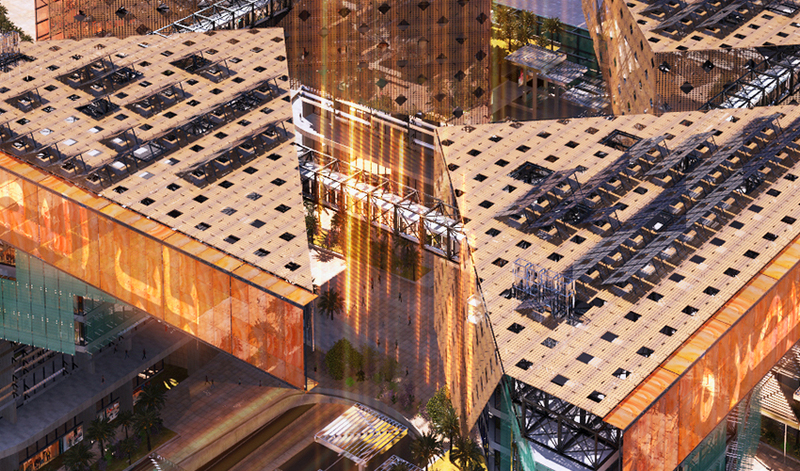 The ambitious multiplex is devised to create a sensation, boosting Basra s disposition as not only a province of great cultural history, but of exemplary progressive purpose.